From 30th July 2015 onward, I will be writing real public health experiences at personal and professional level. This would be related to our preparatory activities and the actual conduct of Oral Cholera Vaccination in 6 selected villages of Nuwakot. In this experiential log of what we believe, what we think and expect, our values and even work ethics will be under the radar of my observation and analysis. First as any narrative - let me try to portray Nuwakot through what I see and saw in yesterday's trip to Bidur Municipality. By the way - Bidur is the district headquarter of Nuwakot, one of the northern adjoining district to Kathmandu valley in Bagmati zone. 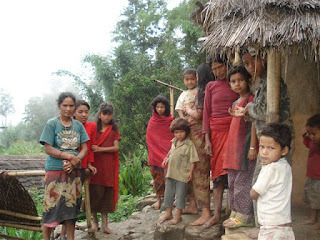 Earlier, I think, it was in the year of late 2010 / early 2011 - I used to travel from Nuwakot for regular Rasuwa visit. At that time, I used to work as a surveillance medical officer whose primary task was the surveillance of vaccine preventable diseases (VPDs) like paralytic polio, measles, neonatal tetanus and rubella. Those were the days of travel and of course - intense learning of applied epidemiology. Now, I think they were golden moments in my courier. Nuwakot has importance in the history of Nepal unification and I will not go into that part of writing. Whenever, I should write of infectious diseases of potential outbreak potential then definitely I can't write further without knowing the geography, the community, the local costumes, weather, flora & fauna and not to forget the local socio - economic dynamics. Nuwakot is in the midhills and yesterday, I could the sense that the geography varies from few fertile valley to hill tops (that is why there is "kot" in its name "Nuwakot" - "nuwa" means nine while "kot" means castle). Through the heart of Bidur follows Trisuli river ("Trisul" means trident of Shiva), which seems to be "ferocious" in terns of force and its speed with dark muddy colored unlike its usual color, volume and speed !! Still - it was beautiful with lush green everywhere reminding me of our village during rainy season. On 30 July 2015 - In the first morning hours, our main goal was to conduct the district level planning meeting in Nuwakot. This meeting was lead by chief, District Health Office, Nuwakot in the presence of all the supervisors who will be involved in the vaccination campaign. The meeting went smoothly and agreed to the vaccination strategy with the final confirmation of the selected villages. While in the afternoon, we took an opportunity to visit some of the selected villages for cholera vaccination. As shown in one of the picture below, we visited Manakamana village development committee, where there were temporary settlements for displaced communities mostly Tamangs from Rasuwa and remote Nuwakots. One aspect we could observe during our visit were crowding and compromised water and sanitation status. 31 July 2015: On this day we primarily updated team members on our preparatory activities. We visited Epidemiology division, Department of Health Services and updated Dr. Marasini on our preparation and any challenges that needs to be addressed soon. The only concern was that there was also Measles and Rubella (MR) vaccination in 14 Earthquake affected districts. We managed to talk to WHO officers in the district along with EPI team and assured that this vaccination will not affect the MR campaign in any ways. Line listing to get accurate number of target population. For this activity, female community volunteers (FCHV) were fully mobilized. Social mobilization activities - FCHVs visited every home to invite community member during the vaccination days in the nearest booth. Inauguration - The OCV vaccination campaign was inaugurated by Mr. Khag Raj Adhikari, Honorable Health Minister, Minstry of Health and Population, Nepal along with Dr. Baburam Marasini, director of EDCD in the presence of Mr, Bishwo Ram Shrestha, District Health Officer, Nuwakot, There was encouraging participation of the local community. Vaccination - Our goal of this vaccination campaign is to achieve in aggregate at least 95 % coverage in first dose vaccination. The campaign was conducted smoothly without any significant challenges or problems. Our only concern was re: taste. There used to be "noise" that the taste of the vaccine is not "acceptable". In contrary, there was no significant complaints re: taste in the community instead local community got vaccinated in happy mood everywhere. There was a high rate of acceptance. In some places, we did not even had to offer water to drink except those who were vegetarian had to complain about its taste. However, people had a perception that medicine does not taste good either it should be bitter or taste horribly bad. After all, medicine is medicine - we need to take it - you like it or not !! In overall, the first dose vaccination has been overwhelmingly successful. Now remains our second dose vaccination. Soon we will have a review meeting in order for us to conduct second dose vaccination in equally successful manner. For now, this is all for first dose - the vaccination has been well received and accepted by the community. No issue with taste, no single report of adverse events. I will continue to write in the second dose vaccination as well.